Where can you buy one in Australia? Which Vive should you get? What can you play on the Vive? [ps2id id=’Where_can_you_buy_one?’ target=”/]Where can you buy one? There are plenty of brick-and-mortar stores where you can pick up either the HTC Vive Pro or just the HTC Vive. Whether you’re in Melbourne, Sydney, Perth, Brisbane, Adelaide, Darwin, or Hobart, there’s likely a store selling a headset near you. Large electronic retailers such as Harvey Norman gaming stores such as EB Games will most likely stock both, but they will be priced quite a bit higher than if you bought if online. Make sure to give them a call beforehand to avoid disappointment. The best place to pick up the Vive Pro or just the Vive would be from a dedicated computer store. PLE Computers (one of the fastest growing computer retailers in Australia) stock the Vive and Vive Pro at a fairly reasonable price. Check out their listings here. However, there’s one store which we’ve found to consistently sell the Vive Pro and Vive for the best price, and that’s Umart. They have retail stores in QLD and NSW (so you can order online and pickup ASAP) or you can get it shipped right to your door. How good is their pricing? They’re around $200-$300 cheaper than any other retailer in Australia. Really. Check out their Vive products here. [ps2id id=’Which_Vive_should_you_get?’ target=”/]Which Vive should you get? If you’re looking to get into the virtual reality world and price is not a factor, go for the HTC Vive Pro. Yes, it costs more, but does so for a reason. It’s got all the bells and whistles, a higher resolution, better tracking, an in-built sound system, and an integrated microphone (so you can chat with other gamers in the virtual world). 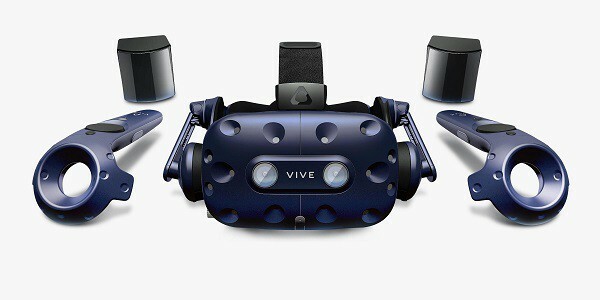 However, at nearly $2,000 for HTC Vive Pro Kit, it may be out of reach for some of you. If that’s the case, I’d recommend not getting the Vive altogether, and take a look at the Oculus Rift (one of HTC Vive’s biggest competitors). The Oculus Rift is priced much lower at around $550 and can offer a very similar virtual reality gaming experience. [ps2id id=’What_can_you_play_on_the_Vive?’ target=”/]What can you play on the Vive? The HTC Vive is powered by the Steam VR Gaming platform. Steam is the largest PC gaming platform in the world, with nearly 90 million users gaming with it every month. You’ll find hundreds of VR games available for HTC Vive in Steam, both free and paid. Gaming titles range from action shooters, zombie survival, adventure, to more family friendly genres such as casual, sports, and simulations. Fruit Ninja, Skyrim VR, and Rick and Morty: Virtual Rick-ality are some of the top selling titles on Steam VR in 2019. If you do want to play the latest and greatest VR games with the HTC Vive on your computer, you’ll want to make sure it meets all the minimum requirements at the least. I’d always recommend getting the best hard drive possible as well (high-end SSD) to make your gaming as smooth as possible. If you’re not too sure which hard drive to get, see here for the hard drive prices in Australia and which one to buy. Virtual reality is still a relatively young industry, but it’s come a long way in a short amount of time. Expect to see more massive leaps in virtual reality over the next few years, both in gaming and other applications. The HTC Vive is currently one of the leading VR headsets on the market today. It’s slightly unfortunate that the high price for the HTC Vive Pro puts it out of reach for many people wishing to enter the virtual world. If you have any more questions about the HTC Vive Pro price, how much it costs, or what you can play on it, let me know in the comments below. We are not affiliated with the above goods/service/organisation in any way. Prices should only be used as a guide. Hi! I'm Mike - I hope you found the post above helpful. I created Aussie Prices because I noticed many websites only provided USA or UK prices, and nothing for us Aussies. So I spent a bit of time researching and put this site together. If you have any questions about the prices - let me know in the comments below. If you want to learn more about what Aussie Prices is all about, click here.